A worthy theme for this week, Photo Challenge: Path, so here goes. Paths can be literal or figurative. Each time I find myself on nature’s path the figurative comes to mind. It is easiest to be present on the path I’m on and not elsewhere, possibly on another’s path. It’s easiest to stay in this time and place for long enough to appreciate it before charging off to another place. The constant need to move forward is not something that is easily avoidable, being human after all. But I tire of the race sooner than many others do. I don’t relish it as some do. What I do relish is the feeling of climbing upward and outward into the world, and the contrasts of the descent off the mountain, and of the path home. A path through the tall trees: Humboldt Redwoods, California. The path home: Gokyo Ri, Nepal. I traveled back to Nepal for the fall trekking season. Flying once again into Delhi, this time on Cathay Pacific, I had learned a lesson from my first trip. On that flight I had done it all in one go from Portland, Oregon to Kathmandu. Thirty-some hours is entirely too long to be traveling, especially if you can’t sleep on airplanes, like me. I did fly Singapore across the Pacific, which helped (Or did it? Come to think of it, the beauty of their attendants hurt my chances for sleep). This is the best airline in the world, and the reasons have to do with service. The beautiful flight attendants are only part of the story. But Cathay is no slouch either. With the length of flight from America to south Asia, it pays to use a quality airline. I got smart this time around & stopped for the night in Bangkok. I then spent a few days in India before continuing to Nepal. By the way, all these images are copyrighted and are available for an easy purchase and download by simply clicking on the image you’re interested in. You can also order prints, framed or unframed. If you have questions, or a special request, please contact me. Thanks for your cooperation and interest. Upon arrival, I stayed a night in Old Delhi, then hired a taxi for a two-day trip down to Agra to visit the Taj Majal. This only cost about $100, and I had two guides for two days (try that in the U.S.). I could have taken the train or a bus and gotten there for about half that price, but we made numerous stops that served to give me a strong feel for the average Indian’s life. So I think it was a steal of a deal. The Taj was the Taj, stunning but crowded. Weeks later, on the way back from Nepal, I visited Calcutta, and I’ve never seen streets so lived in, so dense with humanity. It was really amazing walking the streets there. But this post is all to do with Nepal. When I landed in Kathmandu on a bright beautiful morning, I had a strong feeling of being back among friends. I was met by the folks from my chosen guiding company, Himalayan RST, the one I rafted with in the spring of the same year. But it was more than that: I feel at home in Nepal for some reason. This time I had over a month in the country, and I was very excited on that morning, being back to see the highest mountains in the world. I spent 3 weeks on a trek and climb in the Khumbu region, home to Everest, and one week hanging around Kathmandu. By the way, Mt Everest is called Sagarmatha in Nepalese. I didn’t waste too much time getting started, buying last-minute supplies (including pills for altitude sickness that I ended up not needing). Drying chili peppers in Khumjung, a delightful side-trip from Namche Bazaar. In the densely packed streets of Thamel, the backpacker haven in Kathmandu, you can find anything related to trekking and touring. If you wait until you arrive to buy your gear, you will not be charged too much, provided you can bargain. But the gear will not be of the same quality that you find in the U.S. or western Europe. Much of it is knocked off of companies like Marmot and North Face. But there are real items from these companies available too. It’s a little confusing. I would recommend bringing most that you need from home, but there’s nothing wrong with supporting the community by buying some things in country. After a delightful chat with Sharada, of Himalayan RST, in a tea garden in Thamel (there are little havens like this all over Thamel), I decided on the so-called “three passes trek”. I went with this one because it included the big boy, Everest, and because the trek includes trails that are not so popular. I also decided to take a guide, again since I wanted to explore some relatively untraveled trails. This is by no means necessary on routes such as the Everest Base Camp and Annapurna Circuit. In fact, on any trek where the route has tea houses to stay in, you can be sure that the route is easy to follow, and that you can always ask which way to go if you are unsure. On treks where you camp, only go without a guide if you have good maps and have experience backpacking and route-finding in mountainous terrain. But in any case, it’s a fairly simple matter to trek independently in Nepal. Regarding altitude, take it slow and allow your body to acclimatize. I saw quite a few people who did not get very far into their trek before having to turn around because of sickness. Each person is different in this regard, but everyone benefits from simply taking enough time while ascending. The 3 passes route takes off from Lukla and follows the Everest Trek to Namche Bazaar. It then departs the well-worn path and heads west to Thame and on up to 5400-meter Renjo La (La means pass). Then the route descends to the gorgeous Gokyo Lake and joins a more heavily-traveled route over Cho La. Then it descends to the Khumbu Valley, rejoining the Everest Trek and on up to Gorak Shep. From here you can go up to Base Camp or take the hike up to the stunning viewpoint of Kala Pathar. The final pass, Kongma La, is not heavily traveled. This will take you over to Dingboche, where you descend past the beautiful Tengboche Monastery and back to Namche. I did this trek a bit differently (surprise surprise!). From Gokyo Lake I skipped the well-beaten trail over Cho La in favor of the quiet side of the valley that leads to Gokyo. We descended from the busy trekking center of Gokyo (where I taught the manager of the tea house all about breakfast burritos) to Phortse, a charming, unpretentious and untouristed Sherpa village. We saw plenty of wildlife on the way. 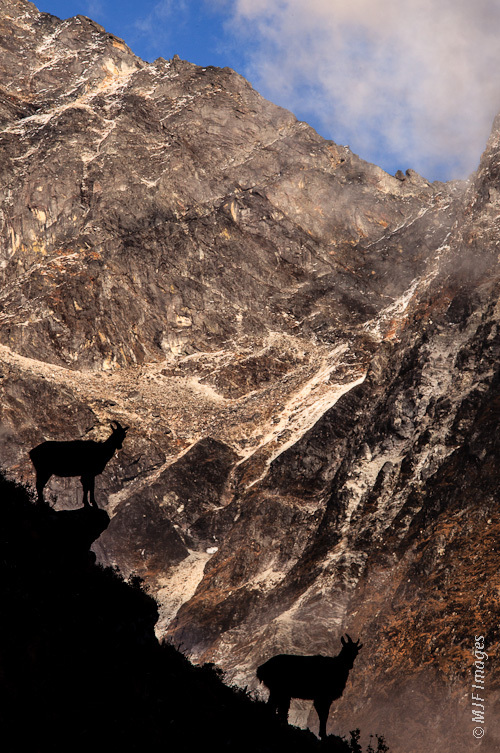 In the Himalaya, if you trek the major routes you will most likely not see wildlife. But if you take any route that is less traveled, your chances shoot way up. A young Sherpa boy in a remote area of the Himalaya of Nepal gives a soulful look. A cute little Sherpa girl takes a break from her sewing lesson (her mother is behind her) to smile and joke with the foreigner. After staying with a Sherpa family in Phortse, we headed up the Khumbu for the most spectacular alpine view I’ve ever taken in, at Kala Pathar. I took a chance and hiked to the viewpoint in the afternoon, when clouds would normally obscure the view. But the weather had been very clear the past couple days, and I figured with everyone heading up in the pre-dawn, that I would, as usual, be different. I was rewarded with a gorgeous alpenglow on Everest and its neighbors. Descending from Renjo La into the valley of the stunning Gokyo Lake, Nepal. I had caught a serious cold. Staying in teahouses you are exposed to all sorts of germs. People from all over the world are sharing fairly tight quarters, and dishes are being washed in lukewarm water (water boils at low temps. at this altitude). Since I was to climb a peak later that week from Chukung, I decided to skip Kongma La and head down the easier way. I barely made it to Chukung (base camp for the climb), very weak & running a temperature. I was not able to join the climbing clinic that was held over the next few days, instead resting and downing huge quantities of tea. I rallied for the climb though, after convincing the guides I could do it (it took my best persuasion). Island Peak at about 6200 meters (nearly 22,000 feet) is the highest mountain I have ever climbed. I feel that given proper time for adapting to altitude, and with help from the invaluable climbing Sherpas, I could climb even the bigger peaks of the Himal. It’s not Everest that stokes my passion but Pumori, an absolutely gorgeous mountain. This costs some serious coin though. The flight in and out of Lukla, the world’s most dangerous airport, was exciting. The runway is actually laid out on the slanted side of a mountain. I met an older Sherpa along the way, a man from Thame, who has climbed Everest 8 times without oxygen. His face said it all. The North Face parka he wore was the most used I’ve ever seen, really the best advertisement for that company you could find. Renjo La and the descent into Gokyo was probably the most spectacular hike I’ve ever done. The hike to Phortse not only had many Himalayan tahr (a mountain sheep), but tons of yaks, beautiful mountain farms, and an intact Sherpa culture. The view from Kala Pathar is unbelievable, several of the world’s highest mountains (including the highest) all in a row. Reaching the top of Island Peak you can see an ocean of Himalayan mountains all around. Tangboche Monastery is one of the most mysterious places I’ve ever been. We attended evening prayers with the monks, and at dawn I was woken by the mournful sound of the gong echoing through the mountains, calling the monks to prayer (and me to one stunning photograph – see below). The evening light is beautiful at base camp the night before climbing Island Peak in the Everest region of Nepal. I returned to Lukla on a beautiful day (our entire trip was blessed with great weather) and next day I was back in civilization. Chilling out in Kathmandu with some new-found friends, visiting Boudhanath Stupa, taking walks through the city, and visiting some of Kathmandu’s attractions was very relaxing after three weeks in the mountains. If you stay in Thamel, you might find like me that you can only take so much of its energy. It is crowded and there is always something happening. But it is also not the real Nepal but a sort of tourist village within Kathmandu. The great monastery at Tangboche in Nepal’s Khumbu region wakes to a spectacular morning. At the end of my stay I traveled up to a place called the Last Resort. It is a camp about 10 miles from the Tibetan border that offers all kinds of adventure sports. From whitewater rafting & kayaking to canyoning and bungi jumping, it is basecamp Nepal for adrenaline seekers. But it’s also a beautiful place to stay and hike to nearby small villages where the people and their culture are relatively untouched by outside influences. I met some great people there, including a Nepali Gurkha (soldier) now living in Hong Kong who was visiting home. Later in my trip, he was good enough to show me around the amazing city of Hong Kong. It sounds cliche to say that I was sad to leave Nepal, but this is one time that I really, really felt that way. And it is the people of Nepal that made me genuinely feel this. Next time I would like to trek a more adventurous and remote route through the Himalaya, perhaps around Kanchenjunga. Also I would love to raft the Tamur River in eastern Nepal. I flew out of the country on my way to another adventure through Southeast Asia, part of what ended up to be a three-month trip. As the Himalaya melted into the distance, becoming indistinguishable from the puffy clouds, I promised myself I would be back to this kingdom of mountains.